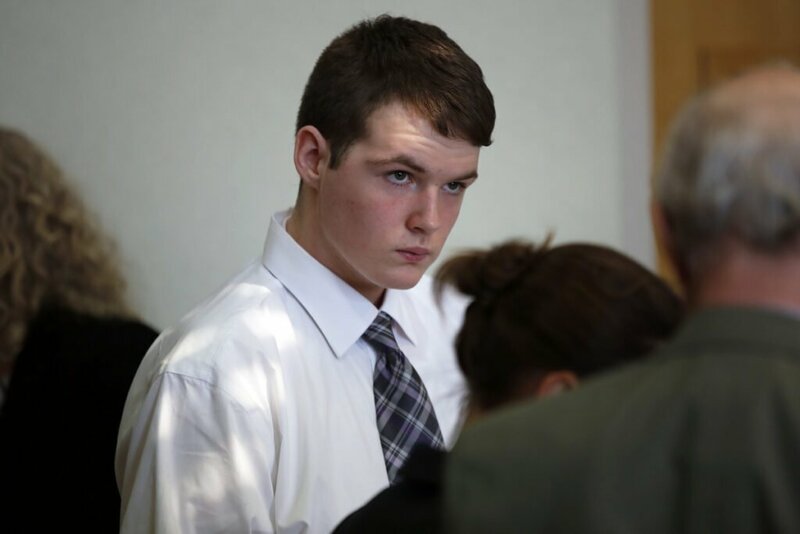 WEST BATH — The Bowdoinham teenager accused of killing his grandmother last year had a volatile and violent upbringing, according to the court testimony of two psychologists. 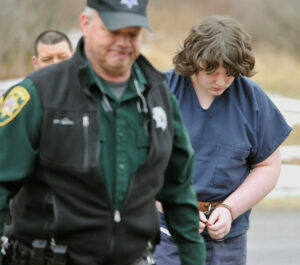 Dominic Sylvester, now 18, is charged with depraved indifference murder in the death of Beulah “Marie” Sylvester. He was just shy of 17 years old when the 55-year-old woman was found unconscious inside the mobile home they shared. New details about their life and Beulah Sylvester’s death came to light Thursday during a hearing that will determine whether he is tried as a juvenile or as an adult. 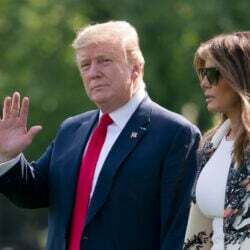 The testimony revealed details from more than 4,000 pages of records from the state Department of Health and Human Services and other social workers, treatment providers, schools and police. While those documents are often confidential and are not part of the public court record, the two forensic psychologists answered questions on the witness stand about their contents. The prosecutor and the defense team used those records to present two different interpretations of the case. Defense lawyers Thomas Berry and Meegan Burbank portrayed Sylvester as a victim. They cast his attack on his grandmother as self-defense, a reaction to years of abuse and neglect. They said he has benefited from stability and individualized treatment at Long Creek Youth Development Center, and the juvenile system offers him more resources for rehabilitation. Assistant Attorney General Meg Elam painted Dominic Sylvester as an aggressor. She said he was prone to violence at a young age and used it to manipulate his grandmother. She suggested Sylvester would still be a danger to the public if he remained in the juvenile system, which would release him at age 21. If he is tried as an adult, a guilty verdict would mean 25 years to life in prison. While Sylvester had years of contact with social workers and service providers, the two psychologists testified he was never removed from the home. Dr. Diane Tennies, a forensic psychologist called by the defense, counted more than a dozen reports to the Department of Health and Human Services about Sylvester. Dr. Debra Baeder, the state’s chief forensic psychologist, pointed to repeated warning signs that Sylvester would hurt his grandmother. “I got the impression after reading all of these that you were somewhat critical of the department,” Berry said during cross-examination of Baeder. Baeder neither agreed with nor contradicted him. She said she noticed the department often passed the family’s case to community service providers, like Sweetser. DHHS has been under intense scrutiny since two girls – 4-year-old Kendall Chick of Wiscasset and 10-year-old Marissa Kennedy of Stockton Springs – died in late 2017 and early 2018. Reports in the Portland Press Herald and inquiries by the Legislature have identified department failures in those two cases and shortcomings in the state’s child protective system. As the attorneys questioned the two psychologists in court, they created a patchwork of Sylvester’s life. The records they cited showed DHHS was involved in Sylvester’s life from the time of his birth, when his mother tested positive for alcohol and drugs. He was placed in his grandmother’s care when he was 10 days old, and he spent his early years believing she was his biological mother. The next incident mentioned in court was when the boy was 8 years old and Beulah Sylvester met with a school social worker to talk about his aggressive behavior. By the time he was 10 years old, the family was receiving what is known as wraparound services, and soon a community service provider was visiting the home regularly for counseling. Sylvester once attempted to hang himself and was hospitalized for the first time when he was 11 years old. The defense team honed in on episodes of child abuse and neglect in the records. Tennies read multiple excerpts from reports that referenced Beulah Sylvester’s drinking as a problem. Caseworkers also reported trying to work with Beulah Sylvester and other family members on discipline strategies – her former boyfriend said he had used plastic zip ties to restrain the boy. Sylvester reported his grandmother repeatedly hit, kicked or punched him. As Sylvester got older and bigger, Tennies said he reported his grandmother would have another male family member threaten or discipline him as well. They fought often, Tennies said, and a dispute about the heat in the home preceded Beulah Sylvester’s death. “It seemed like it was an accumulation of events over at least 10 years of the record where, for whatever reason, at that moment, Dominic felt that he needed to assert himself in this way,” she said. 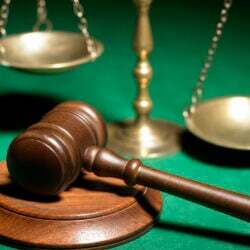 But the prosecutor pointed to different violent incidents. 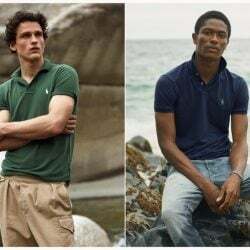 Elam asked questions about threats Sylvester made against his classmates or his grandmother at a young age – once telling her that he would cut off her hands if she turned off his video games again. She cited reports of Sylvester attempting to choke his grandmother in front of a clinician, slapping her once when she was trying to call his caseworker and shooting a BB gun around the house until his grandmother called the police. She read records related to allegations that Sylvester sexually molested a younger relative. The two psychologists disagreed on Sylvester’s future risk to the public. While Tennies said she has seen dramatic improvement during his year at Long Creek, Baeder said she is afraid he will not be ready to leave a secure environment by the time he is 21 years old. Sylvester has been held without bail at the Long Creek Youth Development Center in South Portland since his arrest. 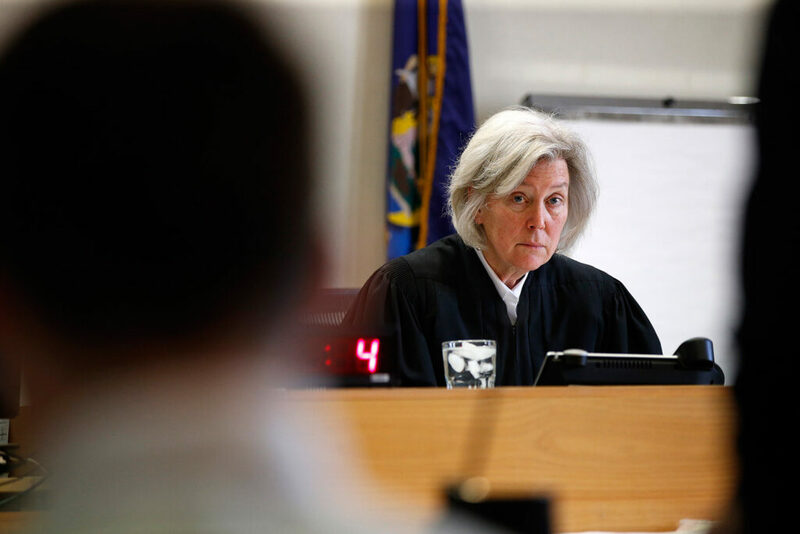 The hearing will include as many as five days of testimony in West Bath District Court, and Judge Beth Dobson will not immediately issue a ruling. On the opening day, Sylvester occasionally wrote notes to his lawyers on a yellow legal pad, but he did not speak to the court. His shaggy hair from his first court appearance last year had been cut, and he wore a collared shirt and tie instead of an inmate uniform. If Dobson decides Sylvester should be tried as an adult, his case will be presented to a grand jury for an indictment. If she decides he should be tried as a juvenile, the case would go to trial before a district court judge. The charge means that even if he didn’t intend to kill her, Sylvester acted in a way that showed no regard for whether she lived or died. A bindover hearing is unique because the defense must prove the case should remain in the juvenile system. 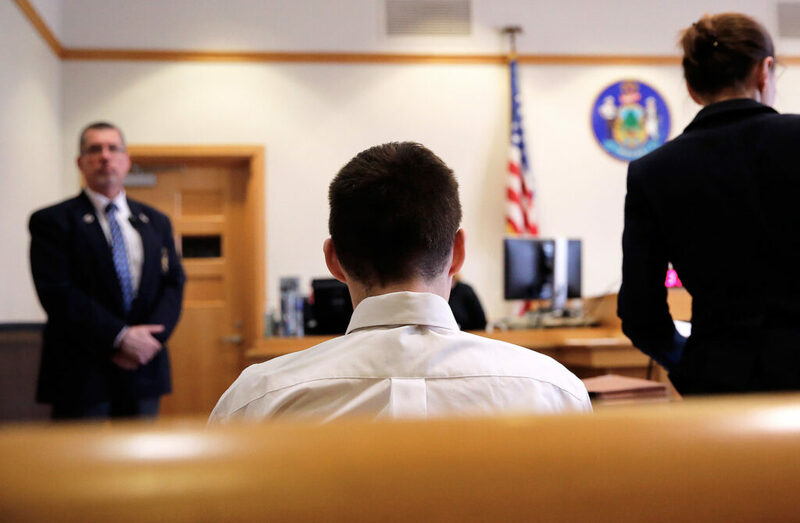 Maine law requires the judge to consider four factors: the seriousness of the crime; the characteristics of the juvenile, such as his history, age and emotional state; the public safety risk; and the dispositional alternatives. Dobson warned the parties she would not make a decision immediately.